To pick where a military base goes has to be an easy job. Putting a military base in a place where there’s fighting is a no-brainer. But sometimes you find these bases on tiny islands that can’t be seen, even when you zoom in entirely on Google Maps and have no civilization for miles around. Why they put bases is there is a mystery. 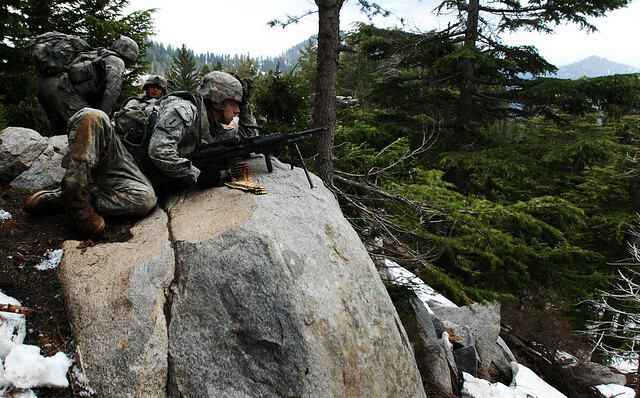 Here are ten of the most remote military bases. Seriously, we feel bad for the guys deployed there; they must have huge balls to survive. Eareckson Air Station, Shemya Island (US Air Force photo). The runway is 10/28 so this image faces roughly west or WNW. Shemya Island is a teeny weeny outpost off the southern coast of Alaska. It’s about two miles wide and four miles long, which is good news if you hate driving. The weather over at Shemya stays at a constant 50 degrees Fahrenheit, so it’s not that bad. However, there is constant fog year-round so good luck trying to soak up some sun. The base was established during the Cold War to watch for any suspicious Soviet satellite launches, and kind of just stuck around. Nowadays, it houses a United States Air Force radar, surveillance and weather station, and aircraft refueling station. Andersen Air Base was a huge deal back in the 70’s, when it was one of the army’s most crucial FOBs (forward operating bases). The base dealt with massive attacks, but also was the go to place for ammo and backup. It was one of the United States’ largest bases in Northern Guam. Today, not much happens there except some re-fueling and ammunition stockpiling. The base gained some attention when it served as the emergency landing strip for the Space Shuttle orbiter. With its awesome sounding name, Diego Garcia is a tiny little atoll in the Indian Ocean. The army has had a base there since the Cold War, mostly so that it can be mobilized in case anything happens in Iran. Today, it’s used as an ammo center for the offensive in Afghanistan. The base is held by the Navy, and often holds training exercises for new soldiers and the surrounding (mostly Indian) natives. Although the island is fairly tropical, seasonal monsoons ensure that troops always carry an umbrella. F-16 Falcons soar over South Korea Falcons soar over Kunsan AB. Kunsan Air Base is located in South Korea, and plays host to both the 8th Fighter Wing of the US Air Force, and the 38th Air Fighter Group of the Korean Air Force. Our presence there is really just a precaution, in case North Korea ever decides it’s had enough of that Southern crap. The base was established during World War II, but was used primarily during the Korean War. Then it hosted multiple fighter-bomber groups, infantrymen, air wings, and basically everything needed to fight the war. Civilization-wise, it isn’t entirely cut off from people, but it is located far away from any other American base. As part of our work in Afghanistan, America has a number of secret military outposts, in remote desert areas, to keep an eye on the Taliban. One of those is the base at Korengal, which was recently vacated so that the troops could be used elsewhere. Surrounded by mountains, Korengal has become known as “Enemy Central”, because of the number of attacks on the base. In its history, the base has lost 40 soldiers, including a gruesome surprise attack on a helicopter that claimed 16 men. Since we weren’t making any headway there, General McChrystal moved the troops out of there, and into a village where they could protect civilians. The road to the Joint Defence Facility of Pine Gap, near Alice Springs, Australia. It’s common knowledge that 90% of the animals in Australia are venomous, which is why a remote outpost in the Outback doesn’t sound very attractive. Pine Gap used to be primarily an Australian base but then, in 2002, the US Army set up operation and converted the base into a satellite tracking station. It’s historically famous for basically being the Australian version of Area 51. Every few months, some rights group or the other marches to it and protests for some Australian issue or the other but, being primarily American, said issue is promptly ignored. Speaking of Area 51, nothing takes the mark for secrecy better than the Holy Grail itself. Well, used to is more like it. Area 51 is situated in the middle of Nevada, and is surrounded by miles upon miles of plain desert and the occasional tumbleweed. For the past 50 years, it has been surrounded by mystery, as crazy nuts everywhere have accused it of harboring aliens or alien technology. In late 2011, the base’s primary activities during the 50’s were declassified, aliens included. Well, that depends on your definition of alien. If by alien, you mean “secret Soviet stuff”, then congrats! You were totally right! Area 51 basically was the bunker that the entire stolen Soviet technology went to for examination. It’s where we found out about fighter jets and the Soviet Nuclear program. The entire base is operated by tunnels underground, where nuclear testing and other secret tests occur. So everyone was right; just replace alien with Russian. Really, what difference is there? 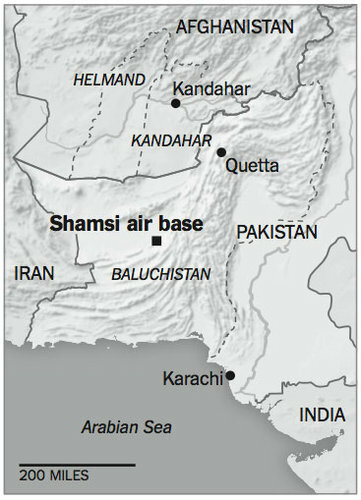 Shamsi Air Base is located in Pakistan, and is occupied by the CIA for its various illegal drone operations. For a long time, no one really knew what was going on in the base, even Pakistan. It was always a sensitive topic at the International Thanksgiving Dinner, probably because Pakistan doesn’t like its property getting blown up by drones every now and then. After Obama upped his status to “Badass in Chief” back in May of 2011, and took down Bin Laden from an affluent Pakistani neighborhood, Pakistan had enough and the base was abandoned. Even the name of this place sounds like the location of a zombie apocalypse video game. Wake Island is administered by the Office of Insular Affairs, U.S Department of the Interior, and an operating US Army base. The Wake Atoll is located about two-thirds of the way between Honolulu, 2,300 statute miles (3,700 km) to the east and Guam, 1,510 statute miles (2,430 km) to the west, it’s technically an atoll because, in addition to being surrounded by water, the center of the island is also water. The place may look like an island paradise, but is routinely battered by tropical storms and high humidity. During World War II, it was the remote outpost that was supposed to keep an eye on Japan, and warn Pearl Harbor if there was to be an attack. The reason it failed at its job is because, before the infamous attack, Wake Island was hit hard by Japanese bombers. After miraculously holding off wave after wave of attack, they managed to send a warning out (albeit a little late). That wasn’t the end for the military base; the US entering of the war led to many more attacks. One was a surprise attack by the Japanese in 1943 that resulted in the deaths of almost every single soldier on the island. Of the 98 survivors that were rounded up to kill, one escaped and carved “98 US P.W 5-10-43” on a rock, before he too was captured and beheaded. Today, the base is largely untouched, but the rock remains as a memorial to those who died in the attack. 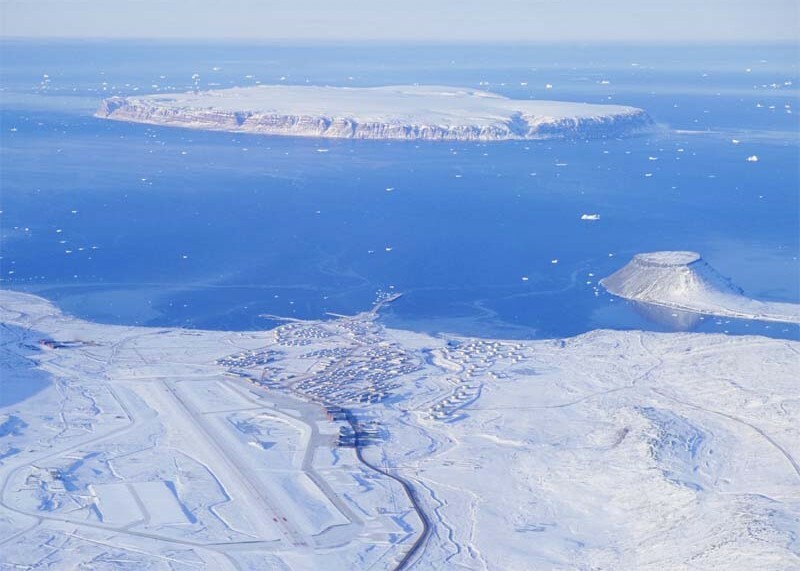 Thule Air Base is exactly what you would think of when you hear “remote military outpost.” It is the US’s most northern base in the world, being only 947 miles away from the North Pole, in Northern Greenland. It is pretty much always ice and snow and cold and everything else you hate. It doesn’t even have any real purpose. Seriously, the base was established as a measure against the Soviet Union, but has seen about as much action as a 50-year-old virgin. Even today, it’s supposed to warn the US against any missiles, except there haven’t been any (like ever, otherwise we’d be at war in Russia). Its only real purpose is to receive new air cadets, presumably to bet on which ones drop out first. What about kwadajlin (sp) atoll in the Marshall islands? I was stationed at Thule Air Base for one year. Trust me when I say it has much more purpose than receiving new air cadets. It’s a remote military outpost for a reason. Dont know where in Australia you’re from but Pine Gap is the most contreversial base in Oz. It was threatened with closure during the Whitlam years but after he was kicked out of office the Liberals renegotiated with their American masters and maintained the status quo. 40 years ago, I was stationed at Fort Greely, Alaska. I’m not saying it belongs on this list, but it was pretty isolated. To get to the nearest McDonald’s, you went out the main gate (well, there was only one gate) and turned right. Then you stayed on that road until you hit your first traffic light and turned left. McDonald’s was 3 miles down on the right. Total distance: about 110 miles. Regarding Wake Island, it’s true that it’s “off the coast of Honolulu.” About 2,300 miles off the coast. Which is like saying that Iceland is off the coast of Norway, and Florida is down the street from Los Angeles. Thanks, Gregory. We have made the correction. I loved your analogy too. why did you write “why they put bases there is a mystery” and then write in each entry in the list an explanation for why the bases are there and what they are used for? very strange. I was stationed on 2 of these. What was surprising to me was the Navy had me complete overseas screening to get stationed in Winter Harbor, Maine. I would like to submit 3 punch lines for you comment, but first I want to thank you for your service to our country. In all seriousness: Thank you for helping to keep this great nation safe. 1. Perhaps some Altoids were in need. 3. Never invite the President to pull your finger. Hmmm…those were funnier in my head. Thank you for coming, please tip your waiters, people. I had to be overseas screened to be stationed at NAS Fallon Nevada. Hate to go all pedantic on you (not really, this is one of my bugbears), but they’re venomous, not poisonous. I just hate seeing nicely crafted posts with things like that in the middle of them. Thanks for the correction. We had a lot on this list. Nice list – it’s amazing just how many remote places you can plop down a military base when the need arises. Had a few chuckles, too. For Anderson AFB, did you mean “Space Shuttle Orbiter” (no italics)? I don’t recall a shuttle by the name “Orbiter”; was Anderson just an emergency strip? Also, you wrote “5-13-43” in the Wake Island entry when the attached picture shows “5-10-43”. Sorry for the nitpicks! Fixed the Space Shuttle error and they 13 typo. Thanks for keeping us in order. We hope toptenz.net is not cast to such nether regions for our author’s mistakes. Did we have a secret space shuttle named “Orbiter” that nobody’s ever heard about? Egads, it keeps getting worse. Fixed. Apparently not. Sorry for this mistake. Can we all just agree this list was very interesting, but had way to many typos? too* – In the spirit of things I just had to. It is so much easier to kick me when I’m down. 😉 And in the spirit of of a good jest I will not even delete this comment. Nothing of what is written here about Pine Gap is even vaguely correct! Pine Gap was opened in 1970 as a joint US/Australia missle tracking station, part of the world wide ECHELON signals intelligence gathering network. It does not have a runway or any facilities for aircraft of any description, also it’s about 18km (11m) from Alice Springs a town of 30,000 people, so why is it on this list is anybody’e guess. Try some research next time! I don’t see the errors you are seeing. I don’t know what conspiracy theories has to do with anything, but Pine Gap is not a solely owned and operated U.S. base like the others shown here and from the introductory paragraph ” But sometimes you find these bases on tiny islands that can’t be seen, even when you zoom in entirely on Google Maps and have no civilization for miles around. Why they put bases is there is a mystery. Here are ten of the most remote military bases”, Alice Springs is less that 20km away. Go to Google maps, check it out. Thats not entirely true or fair. Pine Gap is remote I myself am quite familiar with the area and because it is close toAlice does not make it less so. Furthermore Pine Gap is to all intents and purpose an AMerican base run nearly solely by Americans . This was a bone of contention during the early seventies when Whitlam threated to have it closed down due shared info being reduced to a trickle. This would have meant a blind spot in America’s missile defence network and so could not be tolerated. It has always been controversial and remains so till this day. Not really remote geographically speaking but it may as well be, since you can’t leave the base, is Guantanamo Bay. I was sent there twice on TAD assignments (luckily for only two weeks at a time) in the early to mid 90’s. There is really not a whole lot to do there except work, tan and drink while watching the huge iguanas and banana rats (but hey, they did have a McDonalds on the windward side). I couldn’t imagine being stationed there on a permanent billet. Sounds like no matter how remote the base is, you can still find a McDonalds within a couple hundred miles of it :). Is there some sort of greasy conspiracy in the works? Before you know it we will all have red nose, oversized clown shoe secret police people kickin in our doors shipping us off to french-fry sweet shops screamin HEIL RONALD. Though not active now, my cousin was a civilian air traffic controller on the Johnston Atoll Airport which she described as little more than a “dirt aircraft carrier” . It was so remote that although there was amenities on the atoll, part of benefits of staying there was the ability to go to hawaii, expenses paid. I agree with the first post in the feed; Kwajalien belongs on this list. I travelled there ,to Anderson,to Kunsan, as well as many other bases in Japan/South Korea, etc. with the USO to entetain the troops. Kwajalien was incredible. A bizarre community of American citizens isolated from the mainland. They talked gossup like little school girls about eachother, and they all liked to party like Kwaj was a jimmie buffet concert. But Whenever you asked them what they did for a living they said “we look at space” and “we’d have to kill you, lol” (which they would say facetiously). Incrediblely nice people, but really strange culuture. Some weird stuff happens on that island. HI folks. Wake Island fell to the the Jpanese on December 23rd, 1941 so there was no need for a “surprise attack by the Japanese in 1943”. I think what you may be referring to is the slaughter of US POW’s on the island after an American air attack on the island on October 5th, 1943. Good article though. The top ten Secret Bases may be interesting, at least the secret ones we know about that is. You left out beautiful Johnston Island where the fish have 3 eyes and glow green due to the nuclear weapons testing in 1962. OK, a few factoids about backofbeyond bases. First, guys? Gals get sent too. Some of the AF bases, like Wake, Thule, Shemya, are tagged remote tours, 12 month stay. Can do that standing on your head. Spousal unit served at Kunsan and Andersen. He says wasn’t that bad. The real hell holes are the stateside bases where you don’t serve a life time; it just seems that way. If you want to make a Zoomer turn Army green, just say Why Not Minot. I don’t know if it’s still active, but Mt Home AFB Idaho, situated in the middle of the only desert in the state, was another kiss of death. Korengal… bad place, that one! I wasn’t too far away up in Kunar… RC East is no joke! Don’t really think number 7 belongs on the list. Kunsan is anything but remote. Its less than 100 miles, about an hour and a half, away from the SECOND MOST urban and populated city in the WORLD. And its only 80 miles from the US Army base in leechon and and the farthest US base on this peninsula is the US Naval base in Pusan which is about a 100 miles away. Nothing in Korea can even be labeled remote… Japans is right across the pond for Christ sakes, not to mention the US Bases in Japan. and Kunsan is very easy to get to. We’re just over there to keep the NK commies in check and it is the most forward Air Base of the US to deal with Chinese aggressions. Our bases in Taiwan could be labeled as the most forward and closest to China but the Taiwanese base is more for defense while Kunsan is our base to crush everything in case stuff escalates with support from bases in Japan. Obama is no badass – he’s a liberal and was never in the military. He didn’t take down bin Laden – SEAL Team 6 did. Let’s give credit where credit is due – to the brave patriots that deserve it, not to the Comrade Premier. Thanks for sharing, I imagine that was something you won’t forget. Shemya Island has winds, at times, well over 100 mph, even up to 140 when I was there in 1959. It’s winter time temps are at, or around 32. It does snow on Shemya contrary to the average temperature you give it. The base was originally built during WWII in late 1943 and 1944, and held as many as 12,000 troops. Originally intended to be a B29 base for bombing norther Japan. When it was repopulated for watching the Soviet Union missile launching bases in 1958/1959, it may have had as many people on as 200-300. For years it was simply a ghost town of empty buildings. That’s our Shemya, kinda surprised “The Black Pearl of the Northern Pacific’ made your list, but seriously there isn’t a McDonald’s within 400 miles. I landed on several islands in the Pacific Ocean in 1976 that only had a number assigned to them like (B-152).Pretty much a runway with one quanset hut,fuel truck,power unit and light all. Only serviced C-130s and smaller.